SOUTH HADLEY – A black bear wanders through the North Main Street yard of William Niedzwiecki and Deborah Decker. 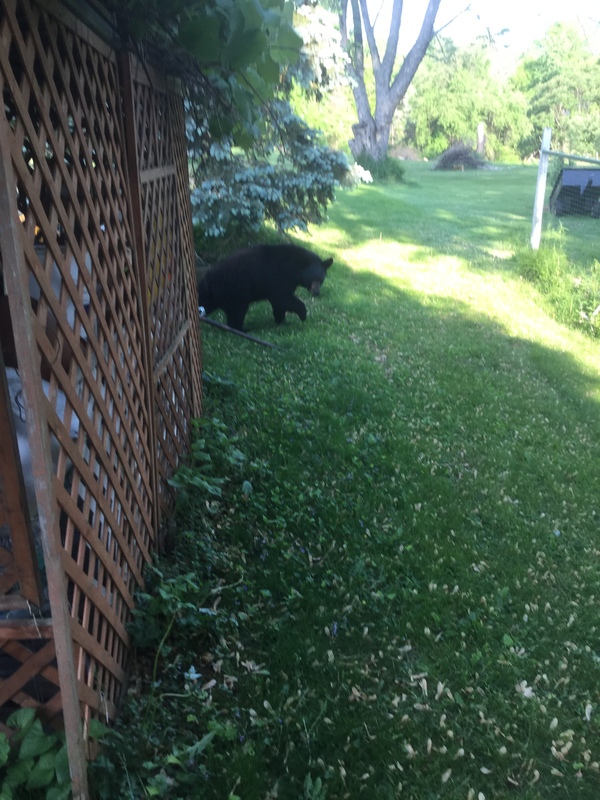 The bear wandered through the neighborhood and then into Loomis Village on May 24. “The bear walked right across our patio, then headed off when he/she heard us talking. This is our first bear sighting in 40 years!” said Deborah Decker. SOUTH HADLEY – Among the different ways to which the town of South Hadley is often referred, “bear country” is not usually one. But according to Marion Larson, chief information and education officer of the Mass. Division of Fisheries & Wildlife, residents should consider South Hadley as such. “I can’t quite emphasize enough – out in your area, bears are common,” she said. And with the wildlife encounters two residents recently had in June, Larson offered tips and suggestions for preventing any more mammalian meetings. The mother bear’s aggressive behavior toward the resident – swiping at him and knocking him to the ground – is likely due to the presence of her offspring nearby. Generally, bears are afraid of humans. Should a resident see or encounter a bear in their backyard or while hiking a trail, Larson said to make as much noise as possible. She said the same tactics to scare off a bear can be employed to other wildlife, such as coyotes. On June 7, a Pearl Street resident encountered a coyote attacking his dog in his backyard. He attempted to physically separate the two, and was bitten in the process. According to the Division of Fisheries and Wildlife’s “Living With Wildlife” publication, a bear may not immediately recognize a resident as a human until it scents him or her. The first response for bears that encounter something unusual is often to flee. If the bear is at the far end of a yard, run in its direction, yell, clap or make loud sounds. If a resident should find him or herself in a situation similar to the Hadley Street homeowner who walked between a mother bear and her cubs, Larson said to back away slowly. Another suggestion Larson provided was to check backyards first before letting out a dog. She also said to stay outside with the domesticated animal. “Certainly it could trigger a bear to become aggressive and do those bluff charges,” she said of dogs. “It’s a very good reason for keeping your dog under control” and leashed. A bear usually enters a residential yard because it’s hungry and it smells food. If a bear does make a neighborhood stop in a backyard, “when it leaves, check around,” said Larson. Take down bird feeders for the summer season. Enclose compost piles and areas. Clean grills and their grease traps. Bring trash to the curb the morning of collection, not the night before. And make sure the barrels are secure. Not only will removing sources of food prevent bear visits, but it also will hinder skunks, coyote and foxes – among other unwanted wildlife – from stopping by. “We have to clean up our habits for wildlife and us,” said Larson. SOUTH HADLEY – When dumping lawn clippings near his yard’s tree line, a Hadley Street resident accidentally positioned himself between a mother bear and her two cubs. According to South Hadley Police Lt. Steven Parentela, the male Hadley Street resident heard a noise Saturday, June 27 around 4 p.m. after empting his lawn mower’s bag. He noticed two bear cubs a few feet away from him in the backyard. As a hunter, the resident knew the cubs’ mother was likely nearby. As he looked quickly around to see where the mother bear could be located, the resident heard a grunt to his left. The mother bear was standing 100 feet away, said Parentela, leaving the resident directly between her and the cubs. The bear suddenly charged at the resident, swiping at his legs. The mother bear caught the man’s left leg with her paw and knocked him to the ground. Parentela said the man was quickly able to get to his feet as the bear again charged him. “He was able to back out of the area while waving his arms,” said Parentela. The bear grunted loudly but did not advance. The man did not sustain any serious injuries. He did receive some cuts and scrapes from the bear’s claws. He did not seek medical attention. Parentela said the man had seen that particular bear in the area over the past several years. This was the first time she showed aggression. Her demeanor was likely due to the resident’s unfortunate positioning between the mother bear and her cubs. A second wildlife encounter occurred on Sunday, June 7 at a residence on Pearl Street. According to Parentela, a 68-year-old man attempted to break up a fight between his dog and a coyote. When the man tried to break the two animals apart in his yard, he was knocked to the ground by the coyote and bitten on his forearm. At the time, an 18-year-old neighbor was in the area and ran to assist the man. As the teen boy arrived to the area, the coyote ran off into the woods. The teen transported the man to the hospital around 9 p.m., according to police. Town Administrator Michael J. Sullivan said the victim needed to receive a series of rabies shots as a precaution. Both incidents were reported to the Massachusetts Environmental Police. SOUTH HADLEY – The tradition of Marine Biology meets the modern art of crowd funding. Robert Murphy, a 2008 South Hadley High School graduate, is working to parlay the two into a doctorate at Northeastern University. He’s already earned a B.S. 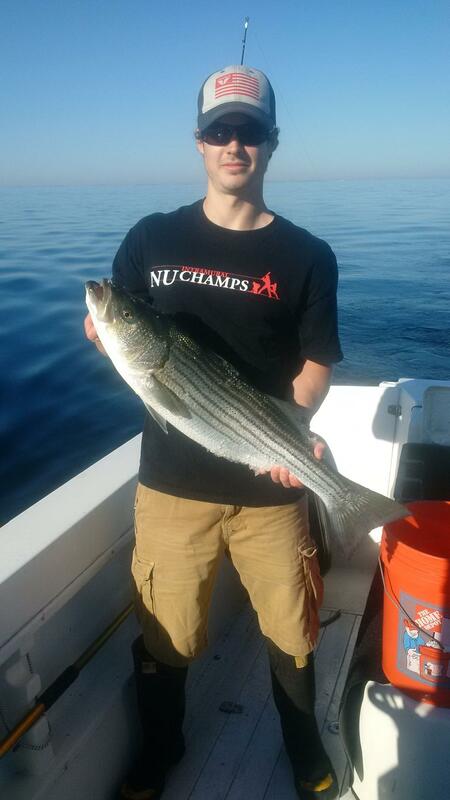 in Marine Biology, and now his Ph.D research and dissertation project is centered on documenting the health of an important recreational game fish: the striped bass, and its prey. Murphy said when his family moved to a house close the Connecticut River, that’s where his interest in fish developed. He fished with his father in the local streams. As an undergraduate at Northeastern, he said he had the opportunity to go to Panama and Washington State and do a variety of research projects to broaden his interest. Fisheries, and their influence on coastal economies peaked his interest. With the University’s Boston location near a Marine Science Center in Nahant, on a finger of land jutting out into the bay, north of the city, Murphy had the hands-on research experience he needed. Farther north along the waters of Marblehead and Salem harbor are the areas where striped bass now congregate in large numbers. How striped bass interact with their environment and prey, like lobster and crab, is of particular interest in determining their long-term numbers. This is where the crowd-funding aspect comes into play. Such research costs money, and Experiment.com helps provide that. Murphy said to think of Experment.com as similar to Kickstarter for products. But this is strictly for scientific research. “It’s mostly universities and graduate students who try to fundraise money for scientific projects,” he said. To contribute any amount to Murphy’s project, visit experiment.com/stripedbass. Contributions so far have exceeded 70 percent of the $10,000 goal, with less than a week to go. Murphy, who is also a talented nature photographer, is offering a printed photo from his portfolio to donors who pledge $100 or more. And, for generous donations of $500 or more, a photo and naming rights for one of his tagged striped bass is available, along with the chance to monitor the fish for two years. All donors, regardless of the amount, will receive regular updates on the project as it progresses. As for his future after earning his PhD, Murphy said he sees himself going to work as a fishery manager, either working for an organization like the National Oceanic and Atmospheric Administration or the Massachusetts Division of Fisheries. Eventually, he said, he could see himself going back into education and teaching. SOUTH HADLEY – Like a preacher of old, Luke Brunelle pointed his walking stick north and led his flock into the icy waters of the Connecticut River. 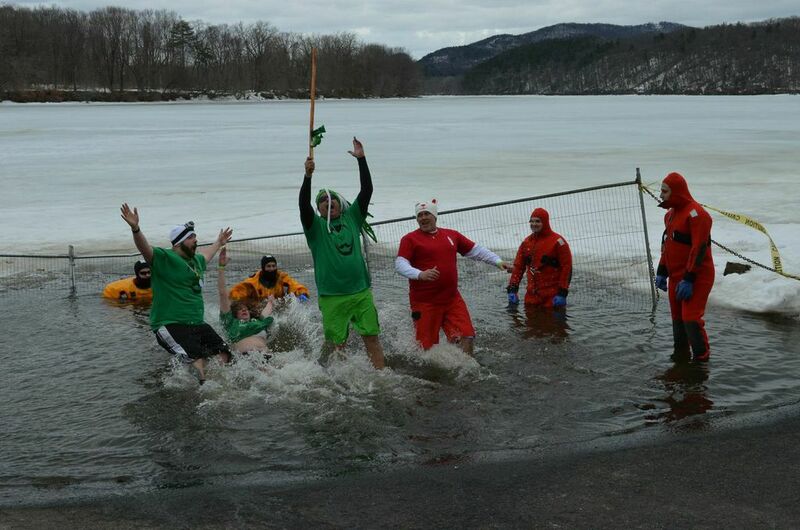 Thus began the annual Leprechaun Plunge, a frigid, madcap spectacle that raised money for a multitude of charities. A sliver of ice was cut out at the river’s edge, down by the boat ramp at Brunelle’s Marina. Hundreds watched from the sides as dozens bravely marched into the unforgiving March waters. Whipping winds, miles of unbroken ice in all directions, barely above freezing temperatures on land and in the water, proved perfect conditions for the plunge. Divers from South Hadley Fire District 1, in full cold water diving suits, held watch over the late-winter bathers. Whoops and gasps spewed forth from the brave souls who immersed themselves in the dark waters. He added the original intention for the plunge was to garner positive publicity for South Hadley. Tony Pluta, a five-time plunge veteran, honored a co-worker who passed away from brain cancer a few weeks ago. “It always seems there’s someone we know as been affected by cancer. Last year, it was my daughter-in-law, 31-years from breast cancer. She’s doing well now. It’s a tragedy we got to keep fighting,” he said. Pluta recalled the 2014 plunge featured 24-degree air and 33-degree water. “Today it will be a little better,” he said. Brian Robinson, of Granby, who plunged for the ‘Kilted Krusaders,’ said his crew raised money for the Jimmy Fund. Like Pluta, he was relieved the river was a few degrees warmer, but not by much. Robinson planned to jump in, jump out and get out of his wet clothes as fast as possible. State Rep. John Scibak D-South Hadley readied by the water’s edge with his Beacon Hill colleague, State Sen. Donald Humason R-Westfield, who dressed formerly in a suit and tie. Like many first-timers, Scibak did not prepare but only observed those who jumped in before him. “I just want to make sure my life insurance premiums are paid for,” he said. Brunelle, who linked arm-in-arm with his teammates, slowly entered the river backwards. Despite the unspeakable cold, he maintained a wide grin and relished every second in the icy bath. Brunelle said his only thought was getting to the hot tub after entering the water. He wrapped himself in a New England Patriots towel. Screams of “awesome” and a litany of creative profanity-filled the air from the river to the hot tub. Despite the verbal onslaught, dozens lined up for the chance to leap into the river. Faith, purpose or a touch of madness, whatever the reason, the sixth annual Leprechaun Plunge provided a community a touch of warmth on a late-winter day. SOUTH HADLEY – Until a local asphalt plant opens in spring, the South Hadley Department of Public Works’ [DPW] will continue to use cold patch, a temporary fix, to fill potholes. And there’s plenty of them around town, thanks to the brutal winter Massachusetts experienced. East Street, from Morgan Street to Granby Road, tops the Department of Public Works’ [DPW] list of streets in the most need of repair. Those repairs are out to bid, he said. A neighborhood meeting about the repairs will be held Tuesday, March 24 at 6:30 p.m. in the public library. Other road repairs set for this year will take place in the Hollywood Avenue neighborhood. Streets include Tampa and Michael Drive. “And then certainly, we have to look at Alvord and Ferry streets,” said Reidy. These streets are in the DPW’s immediate plans. “These streets have been on the plan for a while now,” said Reidy, referring to a five-year plan maintained by the DPW. The town will likely receive close to $1 million in Chapter 90 funds, said Town Administrator Michael J. Sullivan. These funds are used for transportation-related projects, such as road and sidewalk repairs on that five-year plan. “That probably still is not enough,” said Sullivan of the allocation. Deferred maintenance will consume a large portion of those funds. 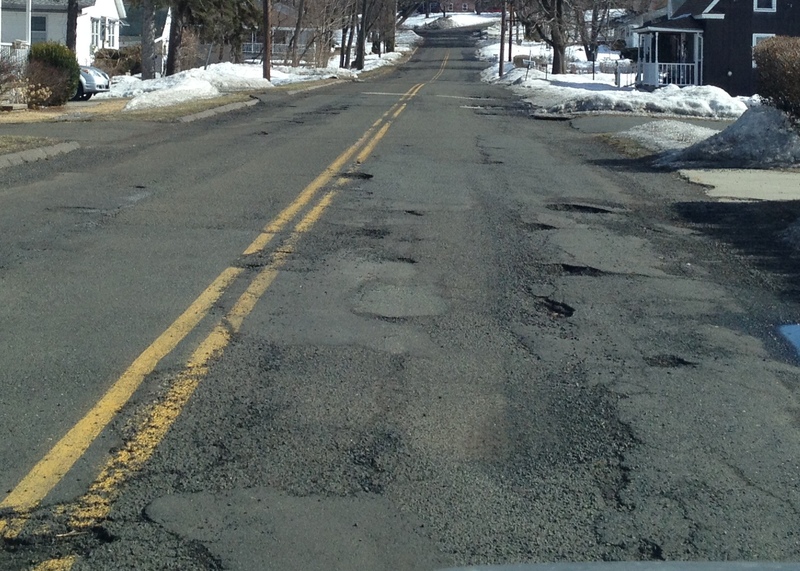 Sullivan suggests residents email dpw@southhadleyma.gov about potholes they’ve come across. Some potholes form overnight and the DPW is not necessarily aware of all their locations. “We’re doing the best we can,” said Sullivan. He’s asked the DPW to construct and place signs in areas where potholes are particularly bad to alert drivers of what lies ahead. The number of claims drivers have filed with the town about potholes damaging vehicles is significantly low – at least one, but not many more, he said. GRANBY – A special town meeting last Monday at Granby Junior-Senior High School passed three articles by wide margins, according to Select Board Chair Mark Bail. Voters gave permission to the Board of Selectmen and Board of Assessors to negotiate a payment-in-lieu-of-taxes (PILOT) agreement for a proposed solar array on property owned by Westover Metropolitan Development Corp. Houses on the site were sold to WMDC and demolished because they were under the airport flight path. A second special Town Meeting approval would be needed to allow the town to enter into any contract thus negotiated with the company. That contract would specify how much the town would receive each year over a 20-year period, Because the land is now owned by the tax-exempt WMDC, the town receives no tax revenue from them. – With a few dissenting votes, despite its endorsement by the Finance Committee, voters agreed to add $85,000 to the current School Department budget. The figure includes $40,000 that was needed to repair a major burst of a water pipe and associated asbestos removal at West Street School, and another $45,000 to pay unexpected out-of-district tuition costs for three special needs children. The meeting was attended by 55 voters, well above the minimum of 30 needed for a quota. Town Administrator Christopher Martin has said it is important for the PILOT process get underway as soon as possible so the Planning Board could begin its deliberations of a special permit for the project. Dr. Herb Abelson commended the Highway Department for its good work this winter and there was a round of applause, Bail said. EDITOR’S NOTE: This is the ninth in an ongoing series of columns written by South Hadley Town Administrator Michael J. Sullivan offering his view of town happenings. I remember when I grew up (and out), the policemen were often stereotyped as something less than professional. Sure, there was the Joe Friday, but there also was Barney Miller, there were the slick Don Johnson types, but there was also the not-so-slick Don Knotts’ types. The archetype cop was portrayed as a donut eating Neanderthal who couldn’t care less about making communities safer. In those days, all the smart guys were crooks, it seemed. Well, I can tell you the vast majority of police today are well-trained, bright, dedicated professionals who care deeply about the communities they serve. I can hear people already dismissing my statements, saying, “What about Ferguson, Missouri? What about the homeless guy who just got shot?” I cannot deny there may be some outliers and some situations where the full truth may never be known. However, I hear from citizens on a regular basis about interactions with the South Hadley Police which are positive, inspiring and sometimes attitude altering. People whose cars are stuck on snow banks in the middle of a storm (as their colleagues keep driving), citizens who loved ones have wandered away only to be returned by a cop who knows the community, residents who have been victims of a crime who are frightened in a way only a peace officer can bring solace or a policeman who inspires youth at risk to get back on track. It is easy to say the Quinn Bill was an unwise investment in the intellectual and social capacity of a police department, unless you can relate to the situations fore mentioned. I hear you, it is expensive, but it is so hard to place a price tag on a crime which never gets committed, because the training and education a police officer receives prevents it from happening in the first place. Recently the crime statistics for the Town of South Hadley were released for 2014. The reductions were quite impressive. Crime in 33 of 35 statistical categories was lower in 2014 than in least one of the previous four years. The total number of criminal incidents was 1,929 in 2014 compared to 2011 when the incident count was 3,207, a 33 percent reduction. Some of the areas where crime incidents have fallen precipitously are “Burglary” (193, 2010 to 63, 2014), “Theft from a Vehicle” (103, 2012 to 51, 2014) and “Robbery” (11, 2013 to 4, 2014). I wish I could reduce my weight in a similar fashion, but then again, the police are putting forth a real effort. Maybe I should try handcuffs. The statistical categories are set by the FBI to standardize reporting across boundaries for easier comparison. I admit some of the reduction is due to security systems, cameras and other devices, along with a better informed citizenry, but do not ignore the difference a well-trained, better educated, appropriately equipped, socially aware, less donut eating, police department makes in this equation. Having had experience with some fine police departments, I can say without hesitation South Hadley has a well-run department with a talented force which every SoHa resident can rest a little easier knowing they are on duty. They are not perfect and everyone realizes there is still work to do, but the statistics do not lie, things are getting safer! Congratulations to Chief Labrie and the entire PD, you should all be very proud. There is no South Hadley Police Officer who will rest on their laurels. They are a proud and competitive lot who will work their hardest to beat back crime even further. That does not mean you should not give them a little positive encouragement next time you see them, but like my doctor says … skip the donuts.